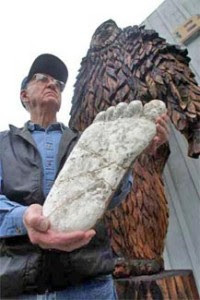 I've been asked by the Willow Creek Bigfoot Days Committee to put out an invitation to all Bigfooters to speak or present at the Bigfoot Days event here on Labor Day weekend, the first weekend in September. There has long been expression of a desire to see the event become more of a Bigfoot-related thing, and not just a small-town community parade and celebration. Perhaps this year we can bump it up a little, advertise that we'll have speakers and a more visible presence of Sasquatch in the event, and put this event on the Bigfoot map in a real way. Since we don't always have a 40th or 50th anniversary of something BF-related, perhaps this can be a yearly meeting opportunity for the Bigfooting community. Also, it could be a first step out for you on a trip up to Bluff Creek. This would not be a paying job, but it may be possible for some travel expenses to be covered, budget permitting. This is a small, not-for-profit event run by local volunteers. However, any of you with books or merchandise, or web sites and research programs you'd like to promote (or just for the fun of it) can pay the low fee of $25.00 to get a vendor table in the after-parade festival event down in the park. There are normally large crowds, music, food, a car show, and lots of vendors at this part of the celebration. If any of you are on the various BF forums, or have a blog or website or BF contacts list then please pass this invitation along. More than likely Al Hodgson will again participate this year (health permitting, of course). He'd probably be willing and able to introduce any speakers. To my mind it would be great to have more than one speaker, presenting differing views on the subject, perhaps leading up to a debate of some kind. The presentations would be given in an outdoor park situation, with a PA system and small stage. It is almost certainly going to be a beautiful, warm and sunny day at that time of year here in Willow Creek, CA. DEADLINE FOR SIGNING UP WILL BE LATE JUNE-EARLY JULY. All official, business-related contacts regarding participation can be directed to Samantha Brown, member of the committee, using her cell phone number: 1-707-845-5083. Or, if you just want to chat generally about BF and the event, feel free to call me at Bigfoot Books, 1-530-629-3076. It would be great to see at least some of you make it up here!